Summer talent development program Promil Four i-Shine, which helps unleash children’s potential, invites parents to enroll their kids in this year’s edition. Promil Four recently launched the newest season of the i-Shine Talent Camp 7 at the Maybank Performing Arts Theater in Taguig. This year’s talent camp will run from April to May. As the brand stays true to its mission of nurturing the gift, the next generation of kids, age 6-11 years old, will be guided to reach their full potential in the fields of performing and visual arts through mental, physical, and social stimulation workshops. Aspiring i-Shiners will engage in interactive learning workshops managed by the finest experts/mentors in the country. Teachers Robert Alejandro and Kara Escay from Papemelroti will handle the Art Camp, Maestro Ryan Cayabyab will return as the camp master for the Music Camp, while Teacher Georcelle Dapat-Sy of the G-Force Dance School will lead the Dance Camp. (Left) Lisa Macuja-Elizalde handles the Ballet Camp and (right) Audie Gemora heads the Theater Camp. Audie Gemora will head the Theater Camp, whereas Lisa Macuja-Elizalde will guide the Ballet Camp. All six mentors were presented during the launch of i-Shine 7, which also featured a talk by Dr. Leticia Peñano-Ho, president of the Philippine Center for Gifted Education. Dr. Peñano-Ho discussed giftedness, how to spot and nurture it, and the importance of documenting a child’s journey to further help them develop their skills. Also lending her knowledge and talent was a self-taught freelance photographer and “Promil kid” Shaira Luna. She shared some photography tips during her Creative Documenting and Scrapbook Making Workshop. Promil’s philosophy is to instill the importance of not only proper nutrition but also proper parenting and guidance to fully support a child’s proper growth and mental development. This is in line with the brand’s advocacy of actively involving parents in helping nurture the gift of their children. 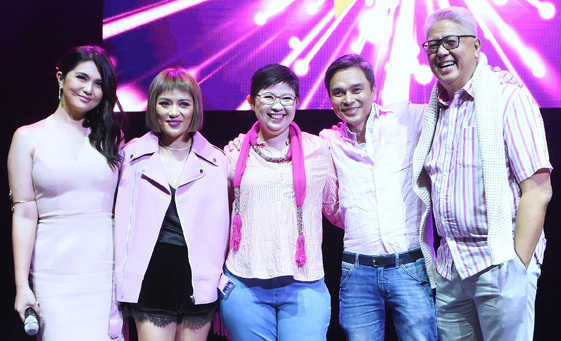 i-Shine Talent Camp host Dimples Romana with mentors Georcelle Dapat-Sy, Kara Escay, Robert Alejandro, and Maestro Ryan Cayabyab. Promil Four i-Shine 7 camps will be administered in Metro Manila, Batangas, Cebu, and Davao. A grand recital will be held at the end of the camp to showcase what the kids experienced and learned.